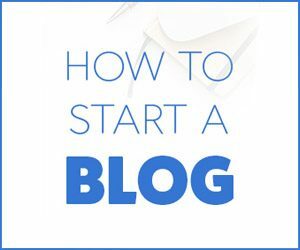 So if you haven’t done it already, you’re probably starting to think about setting up your bullet journal for February (need to know how to set up a bullet journal from scratch? Go here). And what color are you thinking about using? Chances are it’s pink, in honour of Valentine’s day! Although, to be honest, it’s my favorite color for bullet journal spreads at any time of the year. 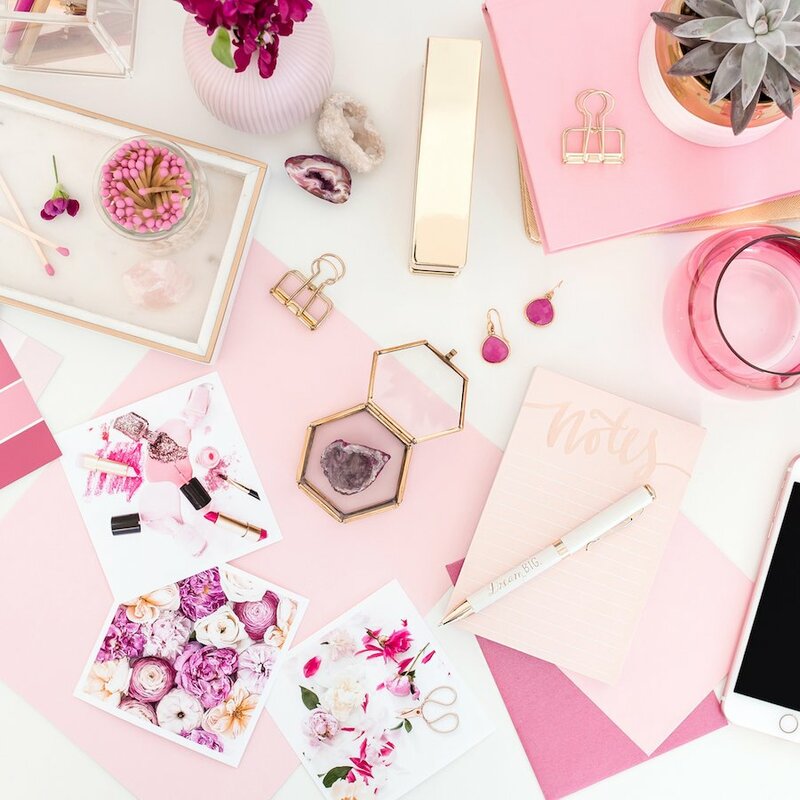 If you’re in need of some inspiration for pink bullet journal spreads, but don’t fancy trawling the internet for hours to find the best ideas, then allow me to help! 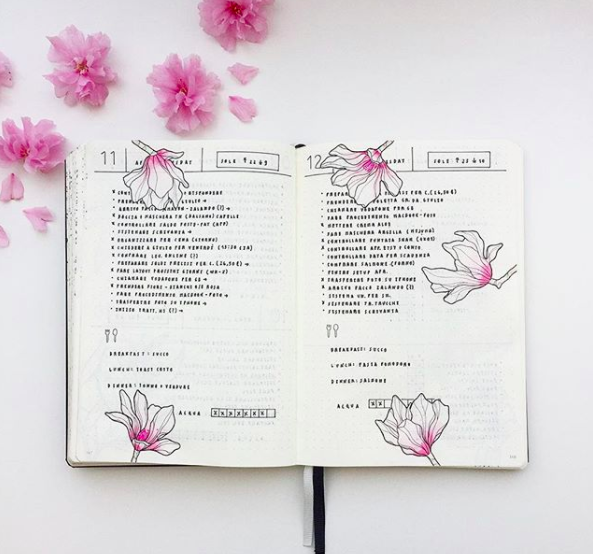 I’ve done the legwork for you, and found 17 of the best ideas for some inspiration for pink bullet journal spreads, for all times of the year! Happy bullet journaling, and happy Valentine’s day!! Let’s kick off with this lovely layout by bluelahe on Instagram. Using a darker colored pink on the lower half of the letters, like in the ‘February’ on this spread, is an easy way to achieve a calligraphy type effect. 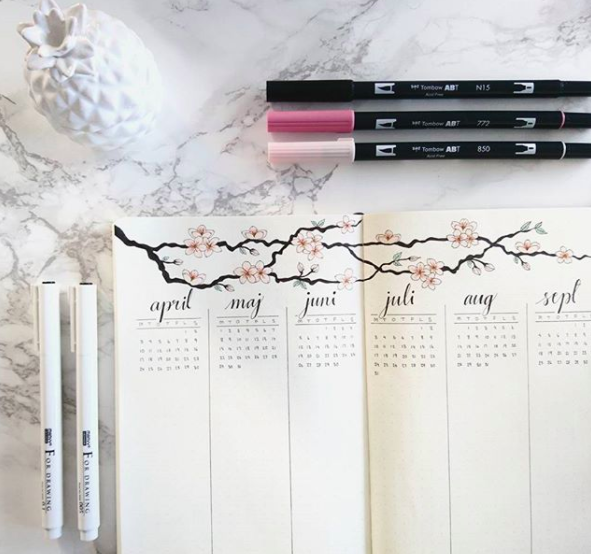 If you fancy getting your hands on the same Giotto pen, they’re available here (and check out this post if you’d like to see some more gorgeous bullet journal supplies). 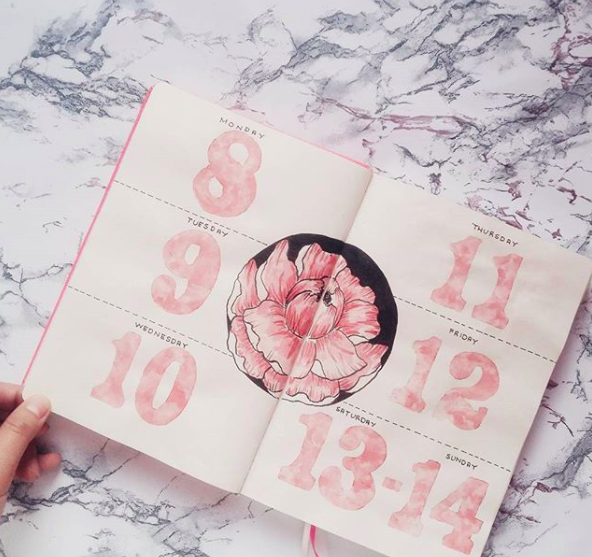 How about this simply gorgeous rose colored layout by amandarachdoodles on Instagram? 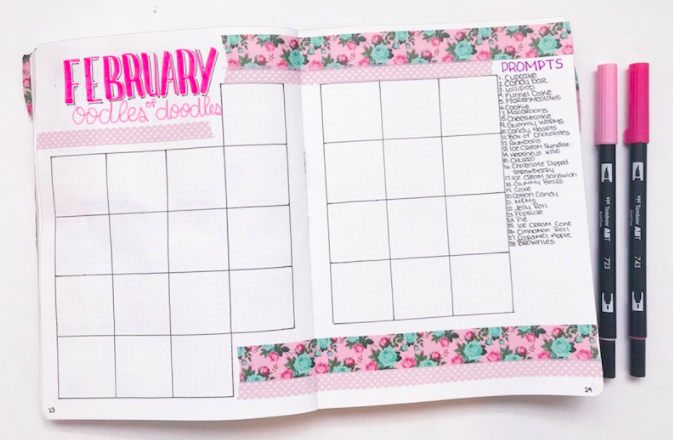 The floral washi tape works beautifully to make this spread look really pretty, without hours of effort. If you’re after something similar, check out this set of lovely Japanese floral designs on Amazon. 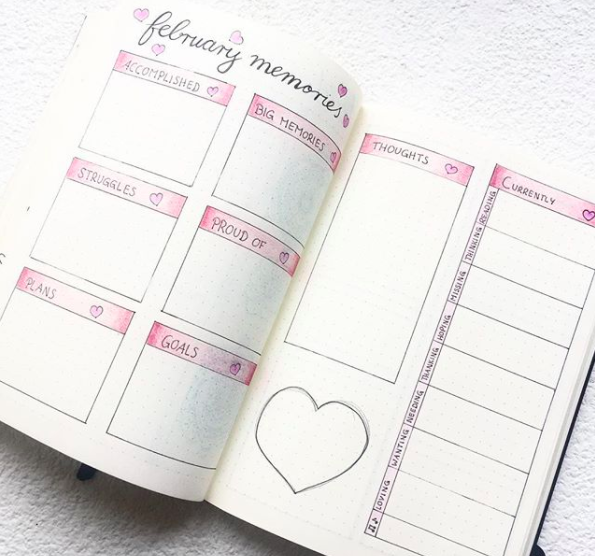 This pretty monthly memories spread by bujo.memories on Instagram, could be adapted for any time of the year. It’s a really simple but effective design, and easy to achieve using Prismacolor pencils simply by varying the pressure on the page. 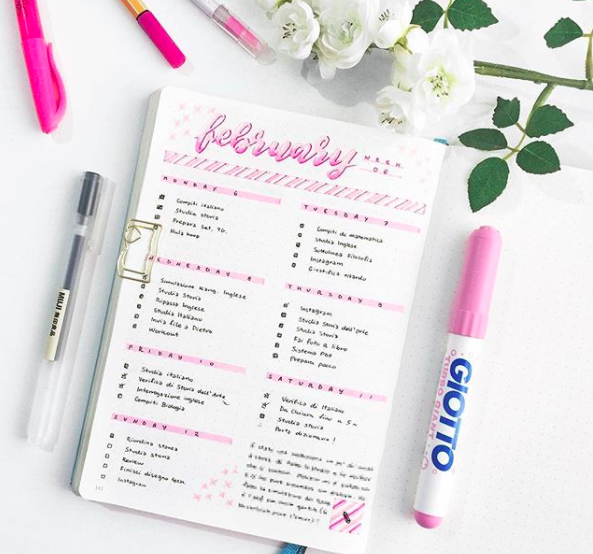 Here’s a more peachy-pink layout from studywithinspo on Instagram. 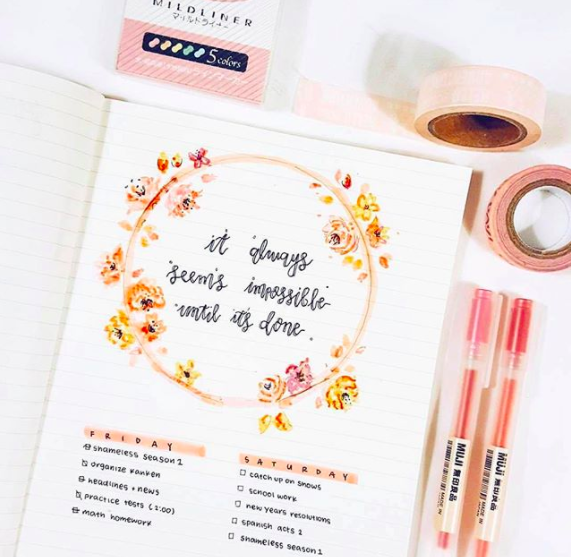 Those flowers are gorgeous, and this is a lovely idea for incorporating a favorite quote in your weekly spread. Amazon has the Mildliners and similar washi tapes to the ones shown in the picture. Here’s another one that caught our eye by bluelahe on Instagram – this girl likes her pink spreads! I love the red combined with pinks, the color clash just makes it more interesting. This could easily be adapted for February by replacing the little flowers with hearts if you prefer. The journal used here looks like a traditional Leuchtturm dotted notebook. I love the ‘Oodles of doodles’ challenge on thepetiteplanner.com! 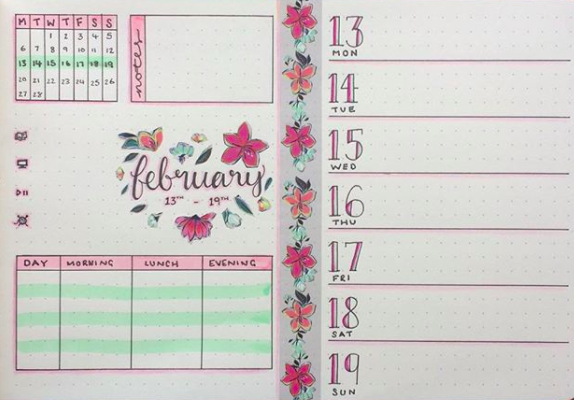 This is a really pretty pink February spread for it. The pens used here are Tombow Dual Brush Pens, which are perfect for all kinds of bullet journal artwork. How simply beautiful are these pink magnolias by feebujo on Instagram? She’s created them using watercolors, but if you’re not ready to try that yet, you could create a very similar effect using Prismacolor pencils with a color blender. Pink and mint green make a beautiful color combination, as demonstrated here by journalphine on Instagram! You could leave out the little bits of orange to create even more of a ‘pink’ spread! Such an amazing artistic spread here by bumblebujo on Instagram! She’s really taken some time over this, and the result is sooo worth it. You only need a black pen and a pink pen to replicate this. I recommend Pigma Micron Fineliners and Tombow Dual Brush Pens like the pink one in the picture. Here’s a lovely idea by mygianthandwriting on Instagram. These hanging plants are a really original idea, and the little touches of red along with the pink work really well. 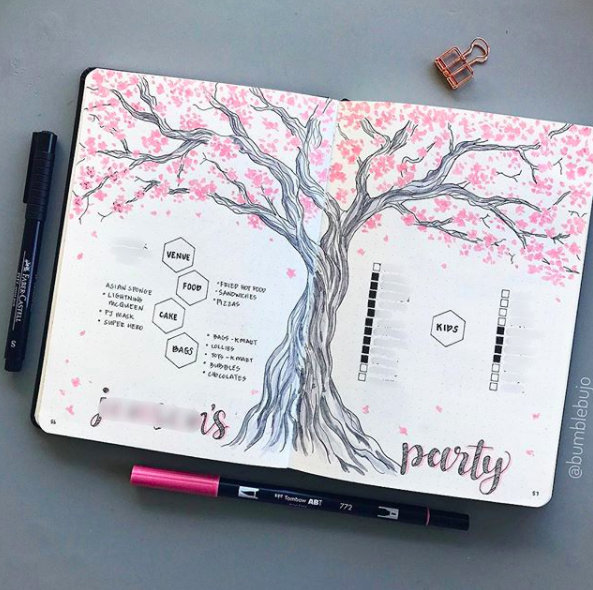 Here’s a beautiful use of pink banners within a weekly spread by mylittlejournalblog on Instagram. 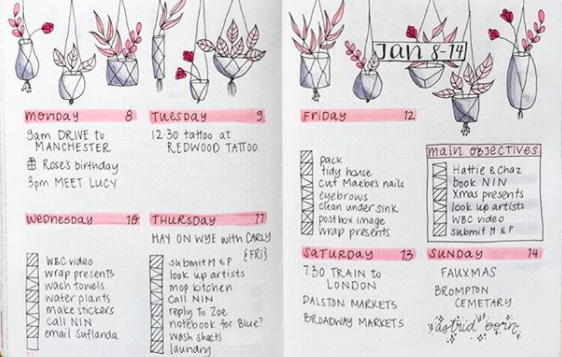 I’ve seen this gorgeous future-log spread by bujobylinnea loads on Pinterest, but never get tired of it! 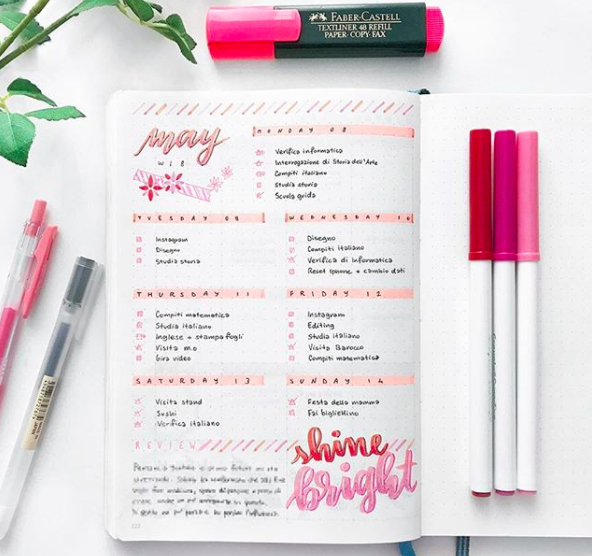 You can easily incorporate a smaller version of the same design into your monthly spreads, and you could use a more vivid pink for a brighter design. Again, this design has been created using Tombow Dual Brush Pens. 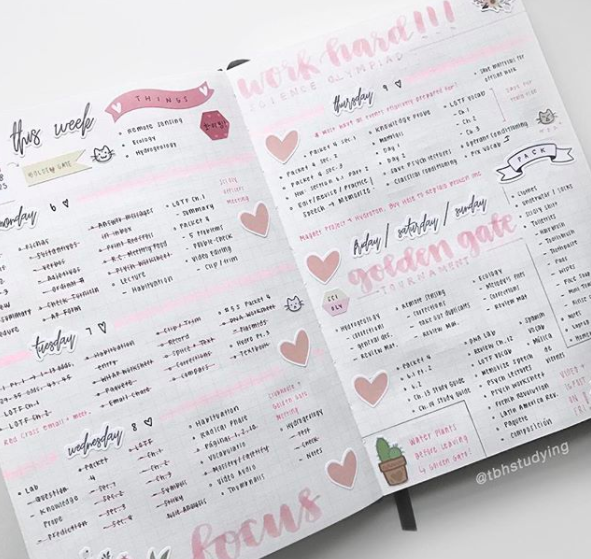 Take a look at this beautiful pink hearts spread by tbhstudying on Instagram. 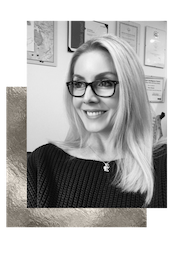 She’s made use of stickers to decorate her spread easily – you can get some very similar ones on Amazon. What a gorgeous idea from juian.k on Instagram! This is another one where watercolors have been used (it looks like even the background has been given a pale pink wash), but once again you could create a very similar effect using Prismacolor pencils with a color blender. 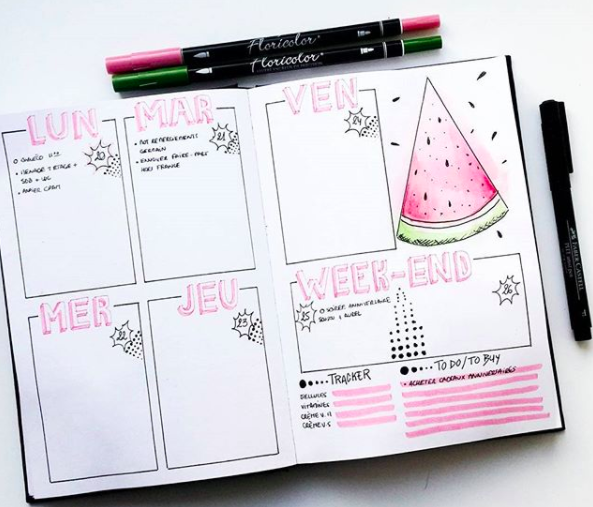 I’m a bit in love with this pink watermelon spread by french_dreamer_life_lover on Instagram! A fruity spread like this would be great for the summer months. Gorgeous! 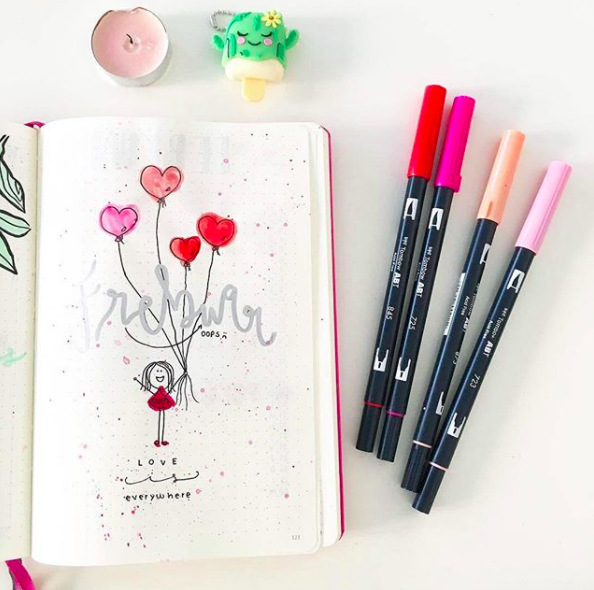 This lovely monthly cover page by planninginspiration4u on Instagram would make a gorgeous Valentine’s themed addition to your bullet journal! Going slightly over the lines like this when you’re coloring, can give a beautiful ‘unfinished’ feel to your illustrations. Time to get those Tombows out again! 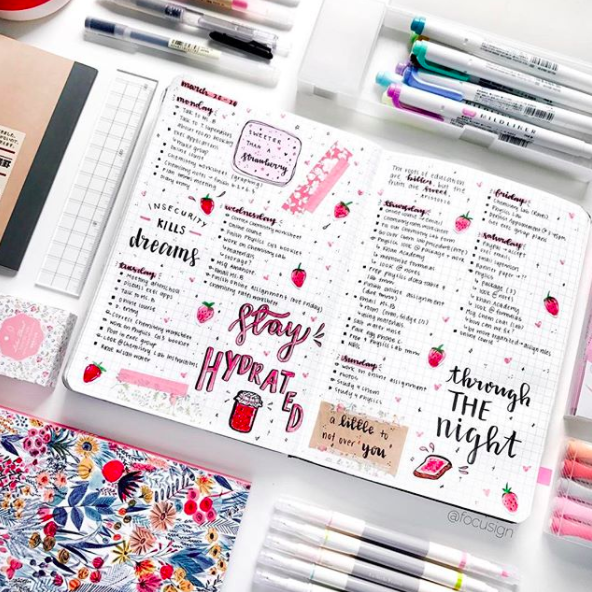 And finally, this strawberry inspired spread by focusign on Instagram is one of my all time favorites! It’s just so pretty, and although it looks like there’s a lot going on, it’s actually relatively simple. 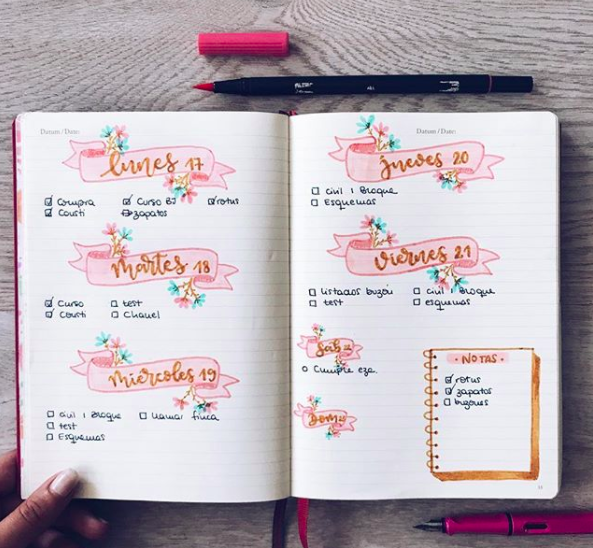 For this spread, it looks like they’ve used a combination of pretty washi tape, Tombow Brush Pens, and Zebra Mildliners. Gorgeous! 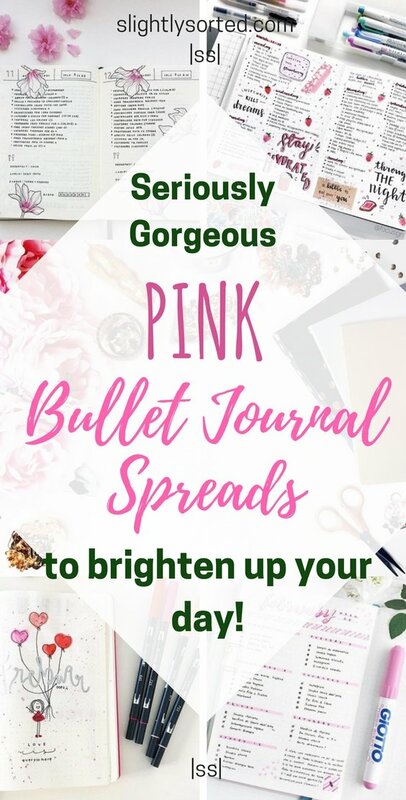 So there you have it, 17 beautiful pink bullet journal spreads to inspire you! Let me know which are your favorites, and whether you give any of them a go! 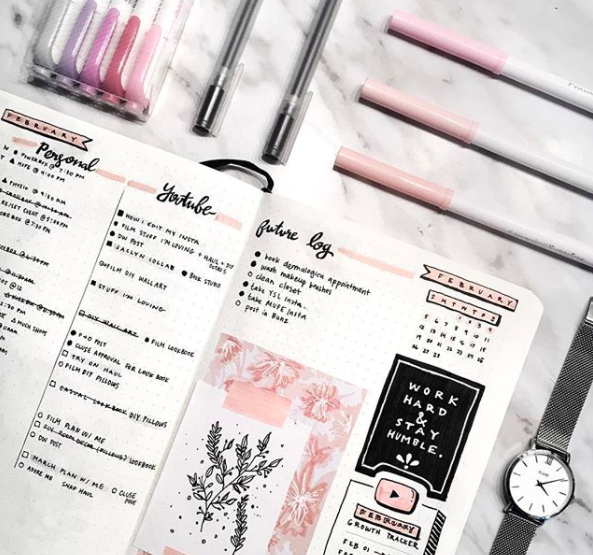 If you’re after some more gorgeous bullet journal inspiration, you can check out my bullet journal board on Pinterest. 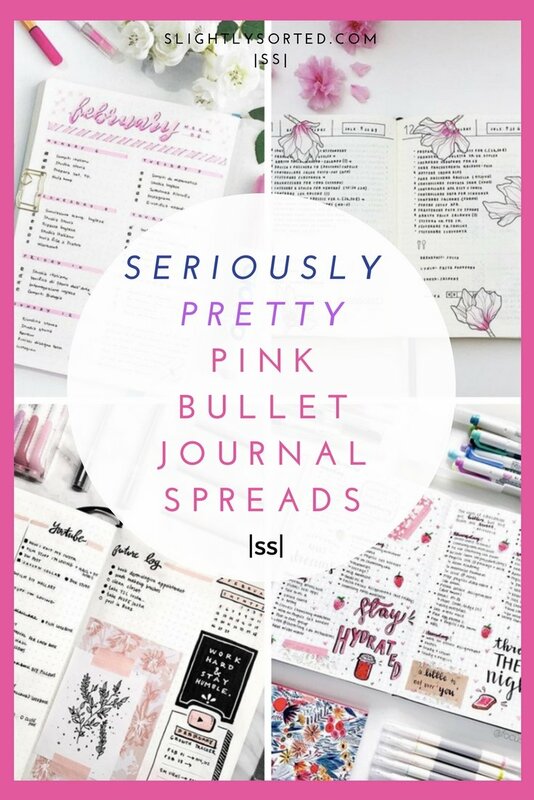 Enjoyed this post on pink bullet journal spreads?… Why not save it for later on Pinterest! Previous Post DIY Valentine’s Day Gifts – 17 Amazing Ideas, Plus 3 Cheats!